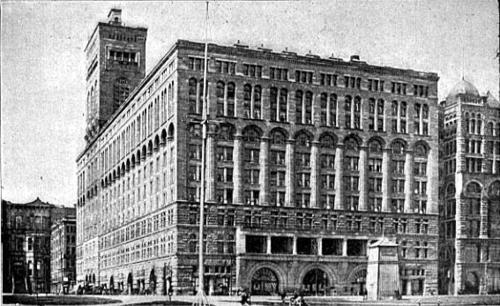 The Auditorium Building in Chicago, Illinois, is one of the best-known designs of Dankmar Adler and Louis Sullivan. 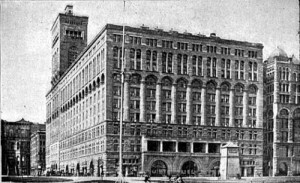 Completed in 1889, the building is located on South Michigan Avenue, at the northwest corner of Michigan Avenue and Congress Parkway. It was declared a National Historic Landmark in 1975. It was designated a Chicago Landmark on September 15, 1976. In addition, it is a historic district contributing property for the Chicago Landmark Historic Michigan Boulevard District. Since 1947, the Auditorium Building has been the home of Roosevelt University. The Auditorium Theatre is part of the Auditorium Building and is located at 50 East Congress Parkway. The theater was the first home of the Chicago Civic Opera and the Chicago Symphony Orchestra. Ferdinand Peck, a Chicago businessman, incorporated the Chicago Auditorium Association in December 1886 to develop what he wanted to be the world's largest, grandest, most expensive theater that would rival such institutions as the Metropolitan Opera House in New York City. He was said to have wanted to make high culture accessible to the working classes of Chicago. The building was to include an office block and a first class hotel.